Lose yourself in the lands of Middle-earth as you complete 45 intricate dot-to-dot illustrations depicting iconic characters and scenes from The Silmarillion, The Hobbit, and The Lord of the Rings. Each puzzle contains hundreds of dots to connect, so each page is a satisfying exercise in creativity and discovery. 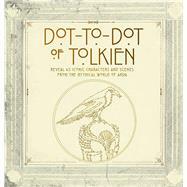 Featuring heroes like Gandalf and Aragorn, villians such as Sauron and Smaug, and scenes from the Shire to Mount Doom, this collection of dot-to-dot puzzles will surely entertain any Tolkien fan.